Cookie got shaved today. She had so much hair that she was always overheating on walks. Given her fear of human beings, especially if those human beings touch her, we were afraid that she might have a psychotic break. But she sailed right through it. Apparently, she is tougher than she lets on. Here is her new look. It's spiffy, all right! Cookie totally does not get why I love summer. She thinks it's too hot, though I am reveling in that fact that it's finally not just plain cold. Bonnie thinks a doggie-summer-haircut would do the trick, but I think Cookie would like that even less. The sound of electric shears might put my high strung pooch over the edge. Cookie doesn't really love the summer garden, like I do. She sits under a tree, lazily watching me do all the work (and doesn't bother to offer to help). She walks right through the center of my flower beds, squashing my beauteous buds as she goes. She doesn't want to be out there without me, and 'ruffs' at the door, if I shoo her out, alone. One would think that a dog like her would love sitting in the sun, chasing squirrels, and luxuriating in the long grass, but my dog just doesn't have much appreciation for any of these things. P.S. It's Adam's 24th birthday today. Happy birthday, honey! My puppy is not a fan of the car. Meaning...she is so nervous that she has piddled herself, or she has thrown up. Today, she had to go back to the vet to get her stitches out. I have devised a whole system to protect my car from her nervous reactions. I have waterproof sheeting put down on the seat and the floor in front of the seat. I take her sheepskin bed and lay it on top of that. I figure having a bed she feels comfortable in will make things less scary. (And it is machine washable, so I just toss it in the washer when we get home...). Doesn't make me want to take her places, ya know? People like to tell me it will get better with practice, but I'm not so sure I want to go through this on a regular basis in order to acclimatize her. I think I'll just keep her around home. The breeder glued our puppy's ears down, so that they would grow to stand at attention. 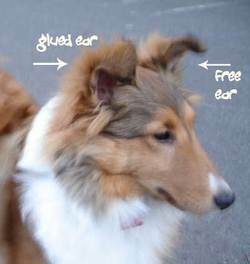 One of the ears has become unglued, while the other is still folded over and glued to itself. So, yes, indeed-y, my puppy looks unbalanced and just a little crazy. Can't wait for the other ear to free itself. We had a bad day of house-breaking yesterday, the puppy and I. On the plus side, I am getting great use out of my birthday present, my carpet shampoo-er...and my carpets are really, really clean. I have been referring to our puppy as Miss Piddle-pants. I don't want her to get too used to it, though. I have my puppy up in my room, having my fingers crossed that she is done with her piddling for the morning. I had my laundry sorted on the floor of my bathroom and the puppy picked out one of my socks as her new favorite toy. I don't mind giving up one sock that I don't really like anyway. And she seems to love it. Cookie and Biscuit are not making nice, as they should. Cookie barks, Biscuit scoots behind the couch, Cookie runs away and peeks around the corner to see if the scary cat has run away...yay! Success! It is a kind of dance they do. Not very satisfactory for the cat, but of great satisfaction for the puppy. I am hoping this gets better soon. Click on the pictures to see them larger...Ain't she sweet? My sweet Barley dog has bone cancer. When he had his growth removed today, the vet was going to check out his knee with an xray if it was still swollen. We thought that he had hurt it when he fell going up the stairs, but I think he fell because of the cancer in his knee. Anyway, our vet was very surprised to see cancer above the joint. My son, Ross, has always been the one who loved Barley the most. He is the most animal-sympatico one in the family. 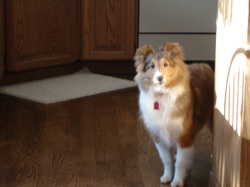 He was with me when I went to pick up Barley at the vet and he was there when the vet said that Barley had bone cancer. He is taking it very, very hard. Do we amputate his leg (right front leg)? Many dogs do well with 3 legs but Barley is almost 13 and he has had problems with his legs for years...weak legs. So, we don't think he would have much mobility if he lost a leg. Chemotherapy isn't an option without the amputation and even with that, all it would do is give him an extra 6 months or so. So, our only real option is to leave it, monitor his pain, and decide when life gets to be too much for him. He is almost 13 and the vet said that a dog of his size would normally live to 13 or 14. So, he has lived quite a good life. We just don't want him to be in a lot of pain. We lost our first cat to kitty-AIDS and that was so sad...and we finally had to put him to sleep, which was very painful, especially for the kids. How pathetic is my dog? Poor Barley wrecked his 'knee' when he tried to climb the stairs to our playroom, where Ross was hanging out on the computer. Seems John and I were gone and Barley got lonesome... Now he is wearing a cast (signed by Ross and I...) and he is spending all his time (when not caught up in sleeping...) trying to chew it off. To add insult to injury, he has to have surgery on Tuesday to remove a growth and then we will probably have to get out the cone, so that he won't worry it too much. In other exciting news, I have 10 17-year-old boys over for an overnight birthday party for Ross. He does this every year. They eat a lot of pizza, play video games and capture the flag, and just have a great time together. But so much testosterone is daunting, to say the least. We realized last night, all of a sudden, that we would need to find someone to dog-sit for us when we go to Scotland. 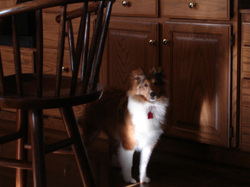 This is going to be 2 weeks, so we can't just leave Barley (our Sheltie) home and have someone come in three times a day to walk him. He would be too lonely. And we can't put him in a kennel for 2 weeks. He would go into his trying-to-knaw-his-foot-off routine. And with 2 whole weeks, would probably succeed this time. So, I had a bit of a panic attack about what we could do with him. But this morning, on my morning Starbucks run, I asked a couple of the baristas if they knew anyone who might be interested. One of them, a sweet 23 yr-old named Katie, said that she would like to. I have spent quite a bit of time talking with Katie in the past and she seems to be a very sweet and honest person. I am thrilled that she wants to do it and she is thrilled to be both closer to work and able to earn a little extra cash. So, yay! One more item off my list. My cat, Biscuit, refers to me as 'that mean lady'. Okay, she can't really talk but I can see it in her eyes. It's not that I have ever been cruel to her or anything, but I am not 'affectionate' in the way that my husband or my son, Adam, is. I am allergic to her, number one. Number two, I am the 'mom' setting and enforcing the rules, like no jumping up on the counters or no going up into the bedrooms. Ross is so allergic that if he touches a place where she has sat, then touches his face, then his eyes swell shut. So, no sitting on the furniture. She is a rule-breaker, has been for the 10 years we have had her. And no one but me actually produces consequences. You break the rule, Bisky, you go outside to think about your behavior. This story has a point. Yesterday, was going-to-the-vet day for my animals. That means Bisky-in-a-box and she hates that box. Biscuit has been outside all morning (her choice) and I know I have to entice her inside for THE BOX. I go out on the deck and starting singing some nonsense like 'come home, Bisky...come home now...' to some or other tune. Sure enough, I hear meowing...she is standing WAY across the yard looking at me suspiciously...'why is the Mean Lady calling me?' her eyes say. I leave the door open and let her take her time, filling her bowl with food cuz I know the sound is an aphrodisiac to her. Sure enough, she's in. Now, the BOX. I get it out of the garage and put it out of her sight. Then, I find her snuggled on her heat register and try to canoodle her out of the corner. She's not having any of it. If the mean lady wants to pet her and pick her up, then something is very wrong. She runs to the back door and starts to cry. I try to soothe her, pet her, break down her defenses...then pick her up. She's buying it. She is thinking, that mean lady is not so bad after all. I'm walking and she sees... the box! Her body stiffens in my arms and I try to put her into it. All four legs meet the box edges and she tries to scramble out of my grip but she's in...and I close the top, saying 'It's not so bad, Biscuit' , as gently as I can. But I have, again, cemented my image...that Mean Lady, who doesn't let you scratch up the household woodwork, won't let you climb on the counters and lick the butter in it's dish, who shoves you into boxes and takes you to the vet. I guess I'm just evil.